Show me how I can see dependencies between pieces of work. Reducing dependencies reduces the need for coordination. Coordination between dependencies can delay the timely completion of work. Creating feature teams, employing work breakdown techniques and software architecture techniques help eliminate or mitigate dependencies. It makes sense to reduce dependencies as much as possible to give yourself the best chance of making a deadline. It’s not always possible and there inevitably are links between different items of work and between key people like an Architect or Stakeholder or some resource like a payment gateway that could have limited availability or be costly to use. 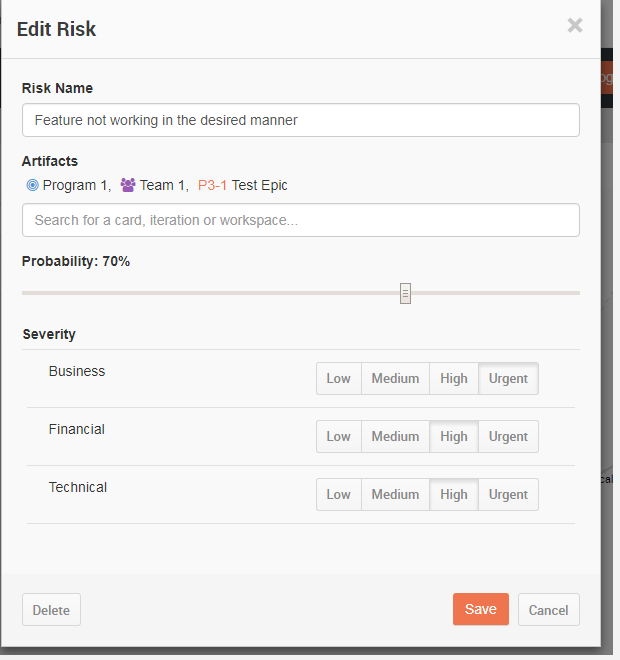 ScrumDo can help you visualize and manage the these types of dependencies as links between work and as risks. A card in ScrumDo can contribute to some overall value. You can see that in the Relationships tab of the card, under Parent Child Relationship. This type of relationship, provided work is broken down appropriately don’t usually create a dependency burden, rather it’s a nice visual way to see how the parts contribute to the whole. It’s the result of the Portfolio Planning work that would have been done earlier. Further down in the same screen, is a section to create a dependency across cards. This is where you can create a link to some other work that is being done, by the same team or another team, and needs to synchronised with. Keeping tabs on these is important because these are the ones that can cause delays and even block progress. The following screenshot shows a link created between cards. The severity and probably is also captured along with various dimensions of Risk. This visualization becomes a point for discussion for those interested in managing the risks, informing decisions on how to deal with it and when to start work on mitigating the risks.